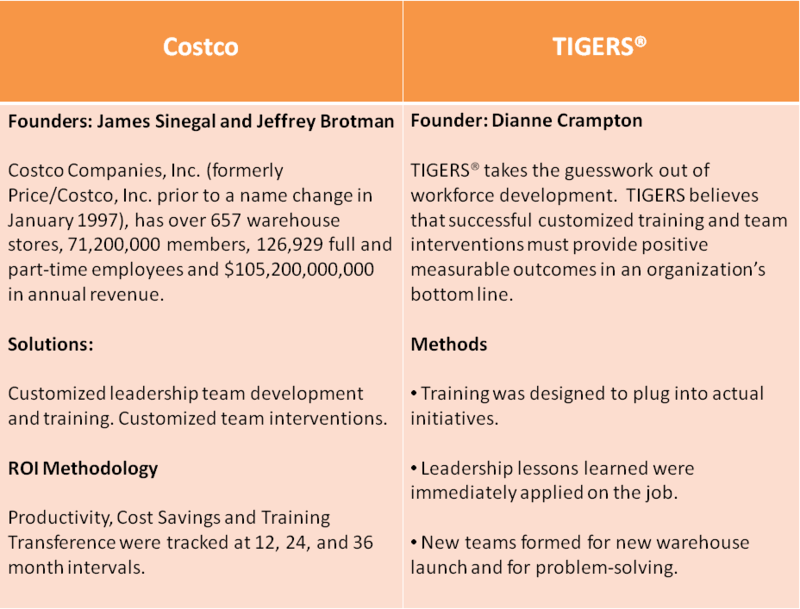 See how TIGERS help make Costco's merger result in improved leadership with superior ROI. Today, Costco’s employee-centered culture outshines many fortune 500 Companies. The company has grown since the merger and earnings are robust. Prior to the merger, however, Price Club received over a million dollars from California to hire and train employees from low income and disadvantaged communities. Much of this investment was earmarked for leadership and supervisory training as employees were recruited and positions filled from lower income communities. As a result, Price Club’s leadership skills outperformed Costco’s. It was Jim Senegal’s vision to bring the leadership competencies of both companies into balance. He chose employee-centered, leadership training and team development as the solution to this initiative. TIGERS emphasized that leadership training is not a one-off event. Good training results in both retention and transference to workplace improvements. When training is strategic, targeted, customized and measured for cost savings and productivity improvements, executives know how training impacts the bottom line. Ultimately, training transference favorably impacts systems organization-wide. Management team scheduling for multiple, full-day training. Holding the company together during this time is one of Chief Executive Jim Senegal’s most visionary achievements. Ultimately, results in leadership skill development won out. For example, improved leadership skills were tracked by both Human Resources and Risk Management with positive revenue results. HR discovered lower turnover rates, lower Workman’s Compensation payouts, fewer sick days and fewer overtime scheduling problems. Risk Management experienced reduced self- insurance rates, fewer OSHA filings and improved company-wide safety practices. Costco’s leadership development initiative produced measurable outcomes resulting in a more robust bottom line. Costco chose TIGERS® as one of a few elite leadership training and team-based workforce development companies to train and develop leadership teams in the United States and Northwest Canada. TIGERS’ five year service to Costco eventually branched out beyond leadership training to project planning and team problem-solving facilitation. For example, TIGERS helped the company’s first female warehouse manager pull together a strong leadership team for record earnings in a new warehouse launch. TIGERS also worked with Costco’s legal team to correct workforce behavior problems in specific locations. TIGERS® deployed assessment and targeted customized training with group facilitation solutions that made leadership skill development real, meaningful and productive. Soft skill leadership development must produce results. Sitting in a class all day learning theory is hard to justify unless what is learned is immediately applied in the workplace for measurable results. TIGERS asserts that it is human nature to want to win – to want to make a difference. When winning as a leader results in better guidance and understanding for employees, how people cooperate to achieve important daily goals improves. The more successful these goal achievements are through reduced conflict and procedural errors, the easier goals are achieved. This success, when recognized, can be repeated. When training connects with executive initiatives — such as bringing merging company leadership skills into balance — proving profitable outcomes is the icing on the cake.